This is a budget laptop masking as an ultrabook, bringing the looks but lacking the oomph and features found aplenty in its competitors. 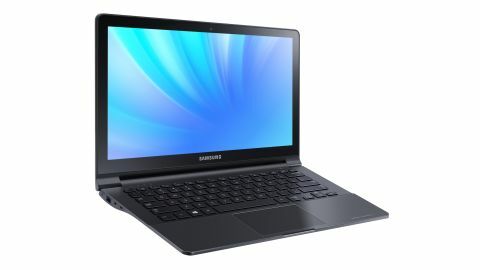 The Samsung Series 9 has long been the jewel in the Korean company's crown, and has set the standard for thin and light laptops for the last two years. The Series 9 was in effect the world's first Ultrabook (although Samsung never let Intel officially share its pride and joy), and was the first Windows laptop to truly rival the MacBook Air in terms of performance and looks. Of course, the Series 9 also had a MacBook sized price-tag, so enter the Samsung ATIV Book 9 Lite, Samsung's vanguard laptop for those on a budget. However, in this instance, 'Lite' doesn't refer to weight, but to features and design (though thankfully also price). The Samsung ATIV Book 9 Lite is available for £499, which is under half the cost of its big brother, the Samsung ATIV Book 9. On the face of it, that's an excellent price for a 13.3-inch touchscreen Windows 8 laptop, and you're unlikely to find a big-brand machine for less. But it's immediately clear from the design that some corners have been cut to keep prices down, and while the lid has the brushed metal effect synonymous with the Series 9 brand, this one's unashamedly plastic. Our version came in a deep, shiny black that manages to look appealing rather than blandly corporate. Open the laptop and you can't fail to miss the sheer thickness of the touchscreen panel. It's relatively weighty, which is something top-of-the-range Windows 8 touchscreen laptops such as the Sony VAIO Pro 13 (£999) manage to avoid. The chassis comprises keyboard, trackpad and ports, yet it's still wafer-thin like the original Series 9, making the laptop as a whole look rather odd. The touchscreen panel's extra bulk pushes up the weight of the ATIV Book 9 Lite to 1.6kg. It's not especially heavy, and the £500 saving on a full-blooded ultra-portable only adds around 300g in weight, which is a compromise most people will be happy to make. It's still slim enough to slip into a bag and carry around, and the upshot of the plastic lid is its resilience against scratches, something the aluminium Series 9 doesn't share. So, on the surface we have a portable and slender laptop at a great price, and one that will suit anyone whose eyes water at the price tags of modern ultra-portables. But can it deliver in terms of performance, or have too many sacrifices been made under the hood? Read on to find out.